"I want an ice cream cone! I want it right now!" shouted Geddes. He threw himself down on the ground, stomped his feet and punched his fists into the floor. His mum stood by, watching him, feeling very embarrassed by his behavior. The screaming continued. "Geddes, that’s enough. Get up. You’re not getting an ice cream and that’s final," Mum said. Geddes didn’t get up. He stayed on the floor crying. "I want an ice cream cone, Mum. You’re so mean! I don’t love you any more!" he wailed. "This isn’t any way for a four year old lad to act. Get up right now!" Mum whispered. As people walked by, they looked at the lad and at his mum. She could hear them muttering things about her. "That lad deserves a good wallop!" one man mumbled. "Imagine her allowing him to act up like that in the shops," whispered an older lady to her daughter. Grabbing Geddes by the arm, his mum tried to pull him up. He collapsed his legs and wouldn’t cooperate in any manner. Finally, out of exhaustion and total embarrassment, she said, "All right, Geddes. I’ll buy you an ice cream cone!" He quickly jumped up and started to smile, as this is what he had hoped to accomplish all along. She bought him his cone and headed to the car. She felt angry that she’d given into him, as usual, but felt she’d had no choice. 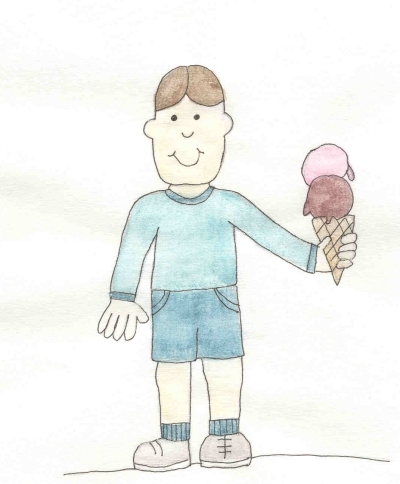 Geddes sat in the back seat, merrily licking his ice cream cone and proud that he’d gotten his way once more. Whenever Geddes wanted something, he’d take a temper tantrum. It didn’t matter to him where they were. It could be the shops, the mall, the bus station, or the doctor’s office; it just didn’t matter to him. All that mattered was that he got everything he wanted. One day, Geddes’s granddad came over to their house. He was going to be watching the lad for the day. Geddes’s mum had to go to the doctor and didn’t want to take Geddes with her. "I’ll be back in a few hours," she smiled, waved, and ran to catch the bus. "Granddad, will you take me to the shops today?" Geddes begged. "I’ve got some pocket money left and want to buy my mum a card, so she’ll feel better." It seemed an innocent request to Granddad. "Certainly, lad. Get your coat on and we’ll be off. Bus 52 will take us right down to the shopping center." Geddes put on his coat. His granddad took his hand and they headed for the bus stop. They only had to wait for a few minutes before the bus came. "Can I put the money in?" Geddes asked. He loved putting the bus fare in. "Certainly, lad. Here you go," Granddad said, handing him several coins. Geddes put them in the right slots and they walked to the back of the bus. "Your mum hasn’t been feeling well lately, Geddes. She seems very tired. You’re not giving her a hard time, are you?" Granddad asked, as the bus drove down the street. "No, Granddad. I’m not giving her a bad time!" Geddes pouted. "I hope not, laddie. Your mum’s a wonderful woman and she loves you very much," Granddad said. They sat silently the rest of the drive. Soon the bus stopped in front of the shopping center. "Let’s go and find you a card and then I need to go into the grocers to pick up a few things for your Gran and my supper tonight." Geddes spent a few minutes picking out a card. It had flowers on it and had a nice poem inside. They walked into the grocers. While Granddad was looking for some kippers, Geddes went to the bakery section. He looked through the glass windows and saw some delicious looking cream puffs. "Yummy," he said, licking his lips. "I want a cream puff." He counted his money. "I’ve only got 30p and the cream puffs are 45p. Granddad can buy it for me. Maybe I’ll get him to buy me two of them." After Granddad had picked up the kippers, he saw Geddes at the bakery windows. "Geddes, come on. It’s time to go home," he called. Geddes didn’t budge. Granddad walked up to him, thinking he’d not heard. "Geddes, it’s time to leave. I’ve got my kippers." "Granddad, can I have a cream puff? I’ve not got enough money to buy one and they look very delicious," Geddes pleaded. "I’m sorry, Geddes. Your mum said not to buy any sweets. We’d better get going," Granddad said. "I don’t want to go. I want a cream puff. Mum won’t mind. She always let’s me get a cream puff," Geddes whined. His voice got louder with each word. Granddad knew what was coming. He also realized why his daughter was having a hard time with Geddes. He was spoiled. He’d gotten his way far too often. Granddad’s voice went firm and strong, "Geddes, that’s enough. We’re going home. Your mum said no treats and that’s that!" Geddes didn’t agree. He knew if he took a temper tantrum, he’d get his own way. He started to cry. "I don’t like you, Granddad. You’re mean. I wish you hadn’t brought me shopping. I want mum. She’ll buy me a cream puff!" He started to cry. Granddad ignored him. Geddes cried louder. Granddad still ignored him. Soon Geddes fell to the ground and started kicking the floor. "I want a cream puff! I want a cream puff!" Granddad just stood there watching. He’d never seen such a spoiled child before. People soon gathered around to see what all the screaming was about. "Look at that lad, Mum," a wee lass said. "He’s acting like a baby." Soon others started making comments. "That wee laddie is spoiled rotten. He should be taken home and put in the corner for a while." Granddad stood still. He didn’t seem to mind what the people were saying. Geddes, though he was crying and whining, heard every word they said. A mum came by with her child in the stroller. "Mummy, there’s a brat crying," the toddler said. "Yes, he’s not acting like a big boy. He’s acting like a baby, isn’t he Michael," the mum said. Geddes stopped crying. Everyone was speaking about him. They were saying he was a brat and a baby. Geddes sat up. He wiped his eyes. He still sobbed and his chest heaved, but he was calming down. He looked up at his granddad, who was standing with his arms folded across his chest. "Are you finished with your temper tantrum?" Granddad asked. Geddes looked around at the all the people. They were scowling at him. They were pointing at him and shaking their head back and forth in disgust. Geddes started thinking that maybe he wasn’t acting like a big boy. Suddenly he felt very embarrassed. He stood up, took his granddad’s hand and walked silently out to the bus stop. He didn’t say a word all the way home. "I’m home," Mum said, shutting the door behind her. Granddad was sitting on the settee watching television. "Where’s Geddes?" she asked. "He’s in his room. We went to the shop today and he wanted a cream puff," Granddad said. "Oh no, Dad. Did he act up again?" she asked, worried about what Geddes had done. "He did. I let him do it. Everyone in the shop saw and I don’t think that you’ll have any more problems with him. I think he learned his lesson today," Granddad said. A few minutes later, Geddes came out of his room. "This is for you, Mum," he said, handing her the card he’d bought at the shop. She opened it and began to read, "Dear Mum, I’m sorry for acting like a brat. I’ll never have another temper tantrum again. I love you, Geddes." She hugged her son and he hugged back. From that day on, whenever they went shopping, Geddes behaved himself. Sometimes he wanted a pastry and other times he wanted a toy, but when his mum said no, he knew better than to throw himself onto the ground or cry. Sometimes she did buy him something. He learned it was much better to behave than to act like a spoiled baby and his mum was much happier too.